Aluminum-plastic recycling line(Zhengyang Machinery: ｗｗｗ．ｚｙｇｒ� ��ｅｎｍａｃｈｉ� �ｅ．ｃｏｍ) is mainly used for all kinds of aluminum tubes, aluminum-plastic bottle caps, car ornaments, and other plastic products separation recycling. 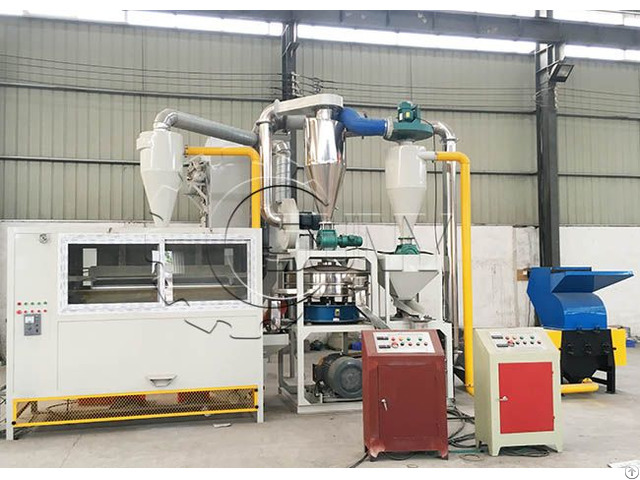 Firstly, by hook the car send a lot of materials into crusher, repass secondary crushing and tertiary grinding powder decomposition, and then through the sieve after the decomposition of the finished material through six roller electric machine one-time separation, separation of plastic and metal. 1. All the process is physical separation, without heating, burning, water and chemical, so it is environmental protection and no pollution. 2. The process low cost, high efficiency and separation rate can be reached 99.8%. 3. The production line is automatic, saving labor; just one or two person is enough for operating machine. 4. This production line is used widely. 5. Production line installation is convenient, has a variety of assembly method, can adapt to different venues. Business Description: Our company is integrating the research, development, production, sales and service. Based on the concept of “responsibility, environmental protection, pragmatism and innovation”, we have been committed to in the research and production, non-standard equipment in the continuous accumulation of experience in production, Till now, our company already Having obtained Great Achievement, in the PCB recycling machine, including the precious metal refining machine, Cable wire recycling machine, Plastic recycling machine, Aluminum-plastic recycling machine, Tire recycling machine etc.